As Bitcoin continues to perform well in recent days, the prices of cryptocurrency stocks are once again in the green. The value of small to medium firms that rebranded with blockchain in 2017 is seeing a significant value boost coinciding the present BTC price rally. In 2017 cryptocurrency was a buzzword that meant astronomical growth. While the likes of BTC, ETH, and other virtual coins were steadily gaining new all-time highs, some company executives came up with a brilliant plan. They decided to rebrand their companies using blockchain. It didn’t matter whether the firm had anything to do with decentralized technology. Some merely added blockchain to their company name, while others branched out into the technology itself. By so doing, many were able to ride the wave of crypto price surge of late 2017. However, the start of 2018 brought with it a massive decline in cryptocurrency prices. The bear run caused the market to lose more than half of its market capitalization with coins like BTC shedding over 60 percent of its value. As crypto prices tanked, the share prices of these “crypto stocks” also declined significantly, showing that there was some coupling between the two. 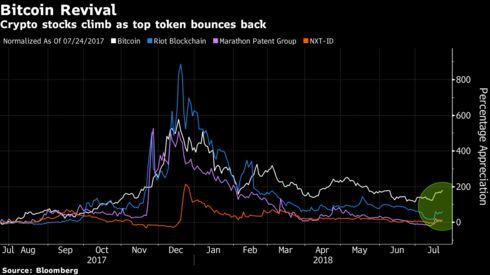 Shares of companies like Marathon Patent Group Inc., NXT-ID Inc., and Riot Blockchain Inc. have increased significantly over the past few days as can be seen in the chart below. Riot Blockchain Inc.’s stock rose by more than 40 percent when BTC price surged on July 17. So far in July, Bitcoin has gained close to 30 percent moving from $6,300 to just above $8,100 (at the time of writing this article). Apart from the price rally, there is a palpable buzz of excitement in the market at the moment due to a raft of positive developments. Today, the top-ranked cryptocurrency has managed to break above $8,000; a milestone last achieved on May 22. 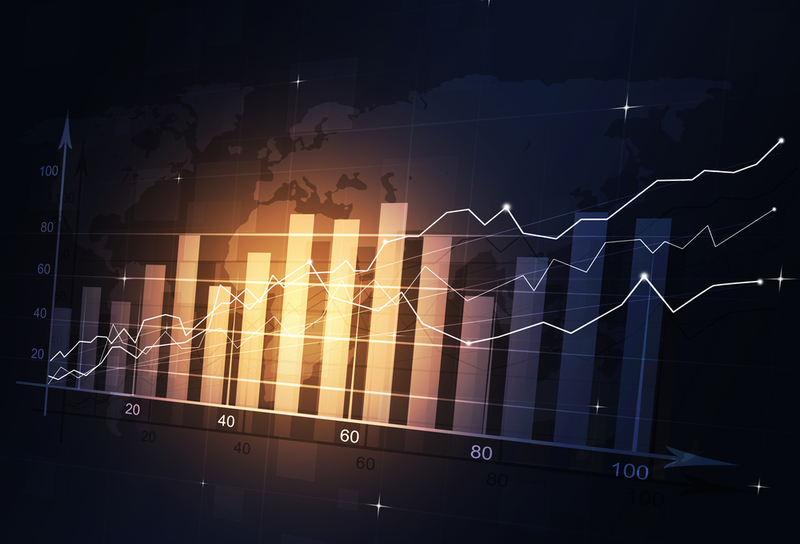 BTC is currently up more than five percent, and traders will be hoping the price can test the $8,300 and $8,500 resistance levels given the positive sentiment that is awash in the market at the moment. What are your views on the apparent coupling between the BTC and crypto stock price performance? Do you think other companies will elect to adopt the once trending practice of attaching blockchain to their brand identity? Let us know your thoughts in the comment section below.